This attachment frees your hands for easy on/off operation. To be used for all machines with a maximum power consumption of 5/8hp (500W).The switch has a housing of glass-fiber-reinforced nylon. The connecting cord is 3ft. 21" (250cm) in length and the output cord is 19.5" (50cm). Ideal for both portable and stationary machines. 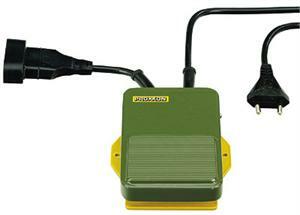 If you are working with our 12V hand-held machines, the foot-switch FS is connected to the transformer.